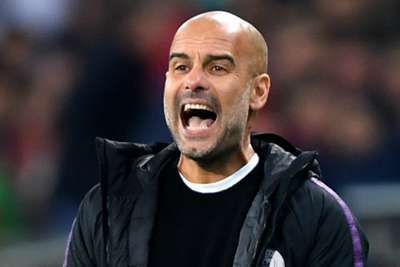 City became the first English team to win away to Shakhtar in Europe as they capitalised on Lyon's draw at Hoffenheim to go top of Group F.
David Silva and Aymeric Laporte scored inside 35 minutes and the margin would have been greater had Gabriel Jesus and Riyad Mahrez been sharper in the opening exchanges. "Incredible. Our first half was the best first half we have played in the last three seasons," the City boss said of the performance. "We were under a lot of pressure after our defeat against Lyon. Our result in the last minutes at Hoffenheim [means] we are in a good position and now we can control our destiny. "What pleases me the most is the way we played. The result is excellent, because we saw in the second half what Shakhtar can do. They pushed us a lot and they always have talented players. "Winning away is so important and we will enjoy this victory tonight and in the next days." City could conceivably qualify for the knockout rounds when these teams meet again at Etihad Stadium in two weeks' time. Defeat there would leave bottom-placed Shakhtar on the brink of missing out on a top-two spot and head coach Paulo Fonseca is already braced for a tough occasion in the return fixture. "It will be even harder to play City in Manchester," he said. "But we will fight until the end and try to earn some points. We play to win every game and the upcoming one will be no different."